For all we know, the panic selling is Wall Street’s way of forcing the Fed’s hand: stop with the rates increases already or Mr. Market expires. Markets everywhere are gagging on something: they’re sagging, crashing, imploding, blowing up, dropping and generally exhibiting signs of distress. Does the market need a Heimlich Maneuver? Is there some way to expel whatever’s choking the market? So what’s choking the market? There are a number of possibilities: somewhere near the top of most observers’ lists are: rising interest rates, weakening credit growth in China, the slowing of China’s economy, trade wars, European uncertainties, currently centered around Italy but by no means restricted to Italy, Japan’s slowing economy, an over-supply of oil, the rolling over of global real estate markets, geopolitical tensions and various technical signals that suggest the 10-year Bull market in just about everything financial is ending. That’s a lot to gag on. 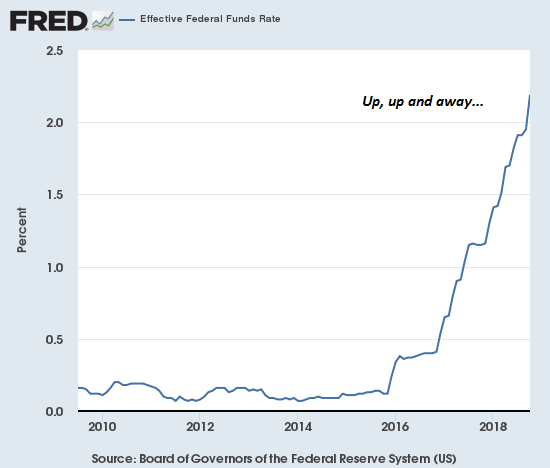 Take a quick glance at the effective Fed funds rate chart below: the Fed funds rate is up, up and away, accelerating to the moon. No wonder Mr. Market is holding his throat and making panicky motions of distress. Which is worse–too much oil or a scarcity of oil? Depends on who you ask. Suppliers are panicking with prices pushing $50/barrel while consumers were anxious when prices pushed $80/barrel. Who can perform the Heimlich Maneuver on Mr. Market? The European Central Bank has been “doing whatever it takes” for 6+ years, and the central banks of Japan and China have had the pedal to the metal of credit expansion / asset purchases for years. That pretty much leaves the Federal Reserve as the only rescuer who has a chance to perform the Heimlich Maneuver, which in this case would be some forceful ejection of the fear that the Fed will keep raising rates aggressively even as Mr. Market is writhing on the floor gasping. For all we know, the panic selling is Wall Street’s way of forcing the Fed’s hand: stop with the rates increases already or Mr. Market expires. And as we all know, Mr. Market is everything to those managing perceptions of the economy. Thank you, Richard H. ($50), for your splendidly generous contribution to this site — I am greatly honored by your support and readership. Thank you, Carl A. ($10), for your superbly generous contribution to this site — I am greatly honored by your support and readership.